Are you dissatisfied with the quality of legal “pros”, the lack of experienced individuals in your area, or the time wasted searching for qualified court reporters? What about all of the other positions you need to fill, services you need to employ to ensure a solid deposition? Discovery offer a supreme level of standard at a price point that keeps the accountants happy. Discovery Litigation Services is an industry leader delivering legal services that will ease the litigation process for you and remove bottlenecks from your workflow. Discovery provides the most qualified Iowa court reporters for any case. All you have to do is click “schedule a deposition” and Discovery will cover the rest. Discovery furnish you with a streamlined web based platform to quickly manage your case, control expenses, and ensure your financial requirements are being honored at every step. Discovery Litigation Services delivers quality. 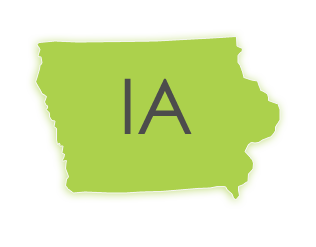 Discovery’s accredited Iowa court reporters are ready to work wherever your deposition is. From expedited transcripts and text-to-video synchronization you can be sure that every facet is covered, with DLS’s court reporters. Discovery Litigation Services was founded by a Alexander Gallo, a seasoned court reporter with over twenty years of industry experience. Working out of the Atlanta office, Alex personally guarantees a hands-on level of quality with sensitive attention to the uniqueness of your case. With Discovery Litigation Services you are getting more. Upon scheduling your deposition with Discovery Litigation Services, you will receive much more than a “set it and forget it” solution. You will inherit an arsenal of tools, an army of highly skilled specialists, and decades of firsthand industry knowledge. DLS's accomplished scheduling team will handle the logistics, supplying you with a meeting room, a certified Iowa court reporter, qualified legal videographer, and interpreter anywhere they are needed. Whether you’re solely here to hire a court reporter or you’re in need of the full collection of tools and support available, Discovery Litigation Services will handle all of the deposition logistics for you. DLS's straightforward online scheduling is your first step to a simpler process. DLS's success is contingent upon your success. Discovery Litigation Services’ unique position within the industry has created an effective avenue into what works and what doesn’t and the knowhow to apply this knowledge to best perform for you. Browse DLS's stable of litigation solutions and learn how to 10x your process, get more time to focus on the facts of your case, and still get the high level results you require. Discovery is a company comprised of experts and specialists with direct experience in various cases and a variety of skills ready to provide you the quality of assistance you deserve. The Discovery Litigations Services web based software permits you to conduct depositions employing electronic exhibits. Parties present at a deposition have the ability to receive exhibits when introduced to the deponent, to leave a deposition suite with their own electronic set of all introduced exhibits which can all be imported directly from your own database. If you want to spend less time consumed by the search for qualified Iowa court reporters, stuck in the hiring process and instead find more time to delve into the intricacies of your case, Discovery Litigation Services is for you.